Please contact owner John at 724-462-one four one five. 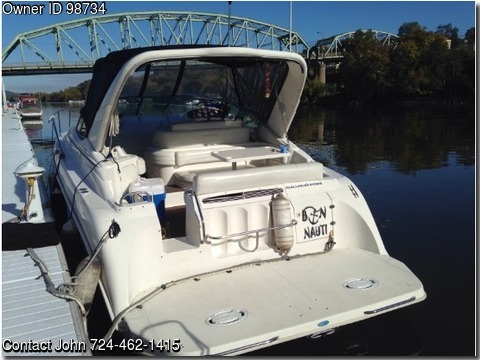 Boat is located in Aliquippa, Pennsylvania. 2000 Silverton 310 Express,Well maintained fresh water boat. Twin 350 mericruiser with alpha 1 outdrives. New bellows, shift cables, gimble bearings, and impellors, installed in spring of 2013. Boat has around 360 hours. Features: -48 inch swim platform from swimplatforms.com-new camper top and canvas in spring of 2012 -westerbeke 5kw generator -heat and a/c -26 inch tv in main salon -powerflush head -windlass controlled from cockpit or toe touch -iPod hookup for stereo-no rips or tears in upholstery -kitchen is complete with refrigerator and microwave Reason for selling is because I bought a bigger boat. The length overall is 36 feet from bow to end of the swim platform. Stored indoors for winter months. Tri-axle loadrite trailer available at an additional cost.